Erie Canal Locks Upstate New York. Oct 14: Banquet with keynote speaker Barry J. Ewell, “Ah Ha! I’m a Genealogist and Lovin’ It.” He is a writer and researcher with extensive genealogical experience in Internet and field research, digital and software resources and mentoring genealogists. He lives in Utah and is the founder of MyGenShare.com. Oct. 15: “Good as Gold” day-long conference with six program topics. Barry J. Ewell will present “Top 20 Lessons Genealogists Need to Know” offering five at each of his four workshops. Other presentations are: “Researching Rural Communities: Local Government Records and Other Sources” by Suzanne Etherington, Region 6 Advisory Officer, NYS Archives Government Records Services; “Often Overlooked: Genealogical Records in Colleges and Universities” by Edward L. Galvin, Director of Archives and Records Management of Syracuse University; “Onondaga County Public Library: One of the Best Kept Genealogical Secrets” by Holly Sammons, Head Librarian of the Local History and Genealogy Department at the Onondaga County Public Library, Syracuse, NY; and “Gadgets for the Traveling Genealogist” by Roger B. Williams, CNYGS member and active in their website development and County Indexing Project. A vendor room with special resources for genealogists is an added feature. Come early or stay after the conference to conduct research at local repositories. Central New York was the earliest major migration route for New Englanders. 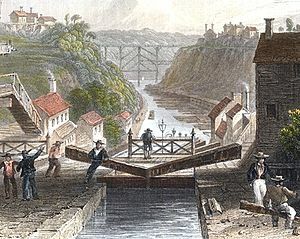 Later immigrants traveled west via the Erie Canal. Detailed information may be found at http://www.rootsweb.ancestry.com/~nycnygs and questions can be addressed though email: cnygs50th@yahoo.com. Sounds like a fun filled day. Put it in your calendar and don’t miss the festivities and great speakers. The Bombay Historical Society announces the formation of the Bombay Genealogical Society. Due to the recent surge in genealogy research, Becky Latulipe, president of the historical society, gave the explanation that the genealogical society would be able to serve the public, under the umbrella of the historical society. The point she made about genealogy being about 90% of what the historical society is all about seems to be a common theme in most historical societies. This is from a press release in the Plattsburgh Press Republican newspaper. There are contact phone numbers in the article if you are interested in joining. The Troy Irish Genealogical Society (TIGS) is charging forward with their massive indexing project of all things Troy. Your ancestors certainly do not have to have been Irish to be included in these collections. TIGS members are working hard constantly making things easier to find the obscure clue that you might need to locate your ancestor that is hiding behind that brick wall. I particularly like the note at the bottom about one of my favorite Vice Presidents. Well most interesting anyway. This has been posted on several NYS mail lists and I know that Bill has asked me before to make announcements for them. “A. The Troy Daily Press is the THIRD newspaper to be added to the Troy Irish Genealogy Website. The records for this paper cover 131 deaths and 460 names on the marriages during the period February 11, 1833 through June 30, 1834. These records will be of great interest to genealogy researchers since the information in this data base predates the 1880 New York State law requiring the reporting of death and marriage records. These records may help with breaking down some of those “brick walls” that you have been struggling with. Also, the residence reported on the marriage records will be of interest as it shows numerous cities and towns throughout New York State as well as Vermont, Connecticut, Massachusetts and other states. B. You can view these records by going to the Troy Irish Genealogy website at: www.rootsweb.com/~nytigs/ and click on PROJECTS and then click on THE TROY NEWSPAPER PROJECT. It should be noted that these records, like most of the TIGS data series, cover the general population in the area and are NOT restricted to Irish surnames. D. Your attention is called to one of the interesting marriage records listed. On July 5, 1833, at the age of 77, Col. Aaron Burr married Mrs. Eliza Jumel. Eliza was the extremely wealthy widow of Stephen Jumel. When she realized her fortune was dwindling from her husband’s land speculations, they separated after only four months. The divorce between Burr and Jumel was completed on September 14, 1836, the day of Burr’s death. As an additional bit of information, you might be interested to know that Aaron Burr and one of the pioneer settlers of Onondaga County, Col. Comfort Tyler, were friends and banded together in 1807 with Tyler as Burr’s chief of military and they were headed down the Ohio River in 1807 to take over what is now parts of Mexico, Arizona and New Mexico with a plan to start a new country. The whole bunch of Burr’s militia were all arrested by federal troops near Blennerhassett Island and put in stockade. Burr was tried for treason in Virginia and was released when the court found insufficient proof, at which time Comfort Tyler and about 40 to 50 of their soldiers, mostly Revolutionary War veterans from Onondaga and Cayuga counties, were released and allowed to return to their homes. Tyler soon moved to Montezuma, New York and started making salt there. Burr became one of the primary investors in the Cayuga Bridge Company which allowed goods, including Tyler’s salt, to reach out to the hungry western markets. You may read our other post about the Troy Irish Genealogy Society by clicking the link provided. To readers of the Upstate New York Genealogy website and blog we want you to know about the Troy Irish Genealogy Society (TIGS). This very active group was founded by some of the Irish descendants from Troy, New York and the surrounding area. If you have ancestors who lived in Troy or the immediate surrounding area at one point in time, you are cordially invited to join the Troy Irish Genealogy Society. This Troy Irish group is dedicated to making available on-line searchable records of Irish ”AND” non-Irish names to genealogy researchers. Now did you notice that great big word “AND”? These great volunteers index everything that they can find and not just your father’s Irish line. The Rensselaer County online Marriage Record Index is golden. If you had ancestors in Rensselaer County you will absolutely find this website of great benefit, and while you are at it, help them out by becoming a member. been like to be the wife on a family farm in Central New York. Harvey Skeele and his friends told us about the role of men on the farm, now you get to hear the rest of the story. We meet at 7 pm in the Fabius Community Center. Everyone is invited. The refreshments are great. Come and greet your friends.